Gloriously unplayable in its unedited form on FCC-leashed terrestrial radio, Wolf Alice’s obscenity-laced single “Yuk Foo” — two minutes of sheer sonic battery acid —was the earliest taste of Visions of a Life, the London band’s second album. Like Blur’s grungy riposte, “Song Two,” twenty years earlier, "Yuk Foo" is a thunderbolt: explosively satisfying and scathing. Wolf Alice's frontwoman Ellie Rowsell rages through its all-too-brief storm with a sly dose of mordant humor too. But there’s always an unconventional, thoughtful layer to Wolf Alice's songwriting. Even when Rowsell is pitched to furious gales and at her most tempestuous howl — as she is here — there’s a wistful slant to her vituperation, a deeper frustration with human behaviour and her vulnerable response to it. The raw feelings stirred by “Yuk Foo” fits the messy emotional beauty of the album — Visions of a Life is a frank, dreamy and visionary follow-up to the group’s critically-praised, Mercury Prize-nominated debut, 2015’s My Love is Cool. In fact, Visions of a Life is a far stronger album, one that cements the exciting promise of this young band: singer and guitarist Rowsell, guitarist Joff Oddie, bassist Theo Ellis and drummer Joel Amey. While it’s easy to seize on elements of grunge’s soft-to-heavy seesaw across the panoply of their sophomore album’s 12 tracks — and a preoccupation with mortality too — Wolf Alice is anything but formulaic. Visions of a Life is boldly tangential and surprising. The album’s second single, “Don’t Delete the Kisses,” is a hazy, half-spoken synthpop swirl of romantic longing and internal doubt, spurred on by a motorik beat (and distantly beholden to Father John Misty). “Planet Hunter” soars and swoons, gently brushed with clouds of mellotron and plangent guitar before it breaks open, like blinding sunlight, into a harder, grittier vista. But what begins as a straight-ahead guitar track takes an abrupt swing into an unexpected “Sadboy” stratosphere: anguished sotto voce recriminations, tattered screams elevated to gospel heights, and the reverberated tailwind of guitar. It’s a stunning song. “Beautifully Unconventional,” inspired by the 1988 movie “Heathers” and notions of destructive coupledom, is deliciously breezy and catchy, but with the wiry groove of “Formidable Cool," Rowsell plunges into more lyrically profane and painful waters. She excruciatingly picks at the carrion of a deadly love affair, driven by Amey’s unrelenting percussive clatter, Ellis’s slinky bass, and the two-tiered, scowling offensive of her and Oddie's guitars. Two magnificent elegies bookend the album: the first track, “Heavenward,” is a loving, gauzy tribute to a deceased friend, as Rowsell ponders a future meeting again, years from now. But by album’s end, she’s already in that place —but the incendiary, eight-minute title track of Visions of a Life is far from peaceful. “I follow the rules, do what it says on the tin,” shouts Rowsell, “But I’m still on the outside looking in.” The song erupts into a mammoth squall — as dense and gorgeous as anything that Led Zeppelin ever recorded — before downshifting by its denouement to a shattered crawl, as Rowsell, broken to a near-whisper, describes her heart literally grasped in her hands. 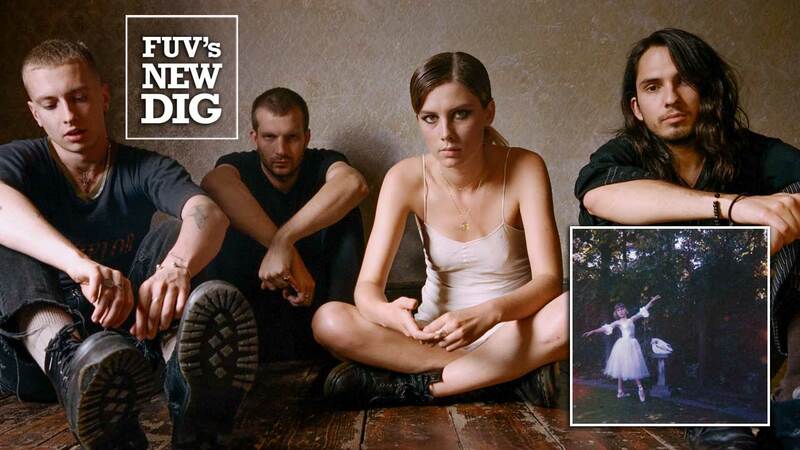 Way back when Wolf Alice released their first singles, like 2013’s prickly “Fluffy” or “Bros,” it was easy to hear that something special was brewing; this was no mere ‘90s-worshipping guitar band. Their thrilling live performances, like an outstanding 2016 set at Glastonbury, and their powerful debut album was an affirmation of that awesome talent — so much so that director Michael Winterbottom even followed them for the 2017 semi-documentary, "On the Road." With the arrival of Visions of a Life, recorded in Los Angeles with producer Justin Medal-Johnsen (M83, The Naked and Famous, Paramore), Wolf Alice has laid everything on the line, releasing a sharply-etched, near-flawless album that's ferocious, intuitive, and fearless. It's always thrilling when a band defies the sophomore slump trope and releases a second album that’s so good that it will forever alter its future — think Radiohead's The Bends, Nirvana's Nevermind, or PJ Harvey's Rid of Me. This is Wolf Alice's watershed moment: Visions of a Life is a monumental achievement. FUV Live on Monday, October 2, at 8 p.m. EDT features a session with Wolf Alice on 90.7 WFUV and streaming at WFUV.org.